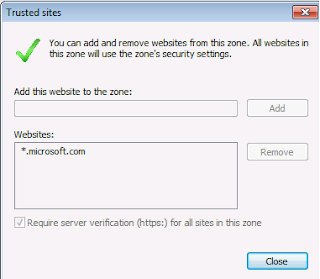 At Windows Server domain environments, we can assign the trusted sites in Internet Explorer by Group Policy. 1. At "Group Policy Management Editor", expand "User Configuration > Administrative Templates > Windows Components > Internet Explorer > Internet Control Panel > Security Page". 2. 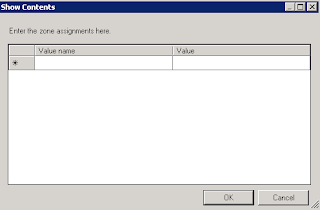 At right pane, double-click "Site to Zone Assignment List". 5. Next to "Value name"﻿, type "*.microsoft.com". 6. Next to "Value", type "2". 8. Close "Group Policy Management Editor". 9. Update the Group Policy in the domain workstations. 1. At domain workstation, launch "Internet Explorer". 2. On the menu, click "Tools > Internet Options". 4. Select "Trusted sites", click "Sites". 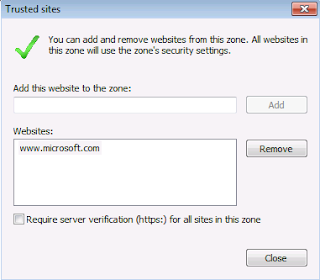 As a result, the web site is assigned to the trusted sites, but users can't add or remove other trusted site﻿. I will show you another method to assign web site in Internet Explorer trusted sites. The domain controller is using Windows Server 2008 or above. Assuming "www.microsoft.com" will be assigned to trusted site. 1. At "Group Policy Management Editor", expand "User Configuration > Preferences Windows Settings > Registry". 2. 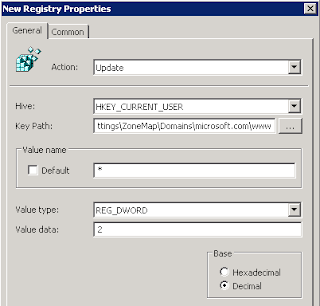 Right-click "Registry", select "New > Registry Item". 3. Next to "Action", select "Update". 4. Next to "Hive", select "HKEY_CURRENT_USER". 6. Next to "Value name", type "*". 7. Next to "Value type", select "REG_DWORD". 8. Next to "Value data", type "2". Remark: If you want to trust "microsoft.com" domain,﻿ you don't have to type "www" in key path. 10. 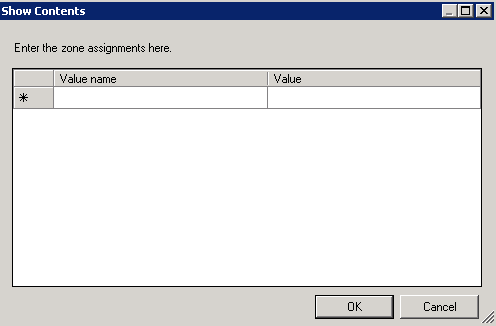 Close "Group Policy Management Editor".